130th Technical Graduate Course (commencing in Jan 2020 at Indian Military Academy (IMA), Dehradun) for permanent commission in the Indian Army. The Indian Army, Is Recruiting Eligible Unmarried Male EnginEngineering Graduates For 130th Technical Graduate Course. So Interested People Can Apply For This Through Online Mode, Within The Given Time Period. 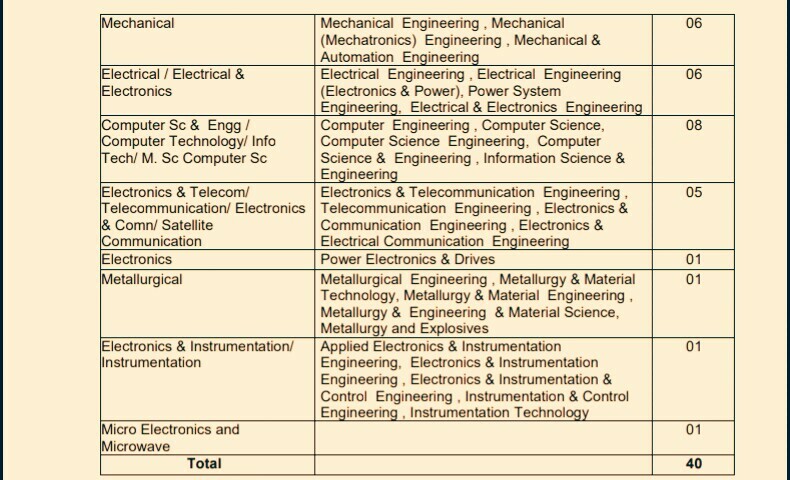 Technical Graduate Course (Various Post Vacancies) →40 Vacancies, Kindly Do Check Out The Images Below For Name Of The Posts, Educational Qualifications & Number Of Vacancies. B. Eligible Criteria For TGC Indian Army Exam 2019. Age Limit →20 to 27 years as on 01 Jan 2020. (Candidates born between 02 Jan 1993 and 01 Jan 2000, both dates inclusive). Last Date For Online Application Form Submission →9th Of May, 2019. Now Apply For 130th Technical Graduate Course .